Most of us, in one point of life, think that all mic stands are the same. That is the beginner’s idea and the inability to understand the importance of a mic stand. You should remember that some of them are made for casual use whereas others are built for constant gigging and studio work. Quality tends to vary based on the model and brand. It is useless to purchase a microphone stand that does not come from sturdy and thick material. Cheap ones will not last long, and that is a fact. It is essential to understand what to look for and which ones are the best for your particular requirements. That is why we decided to present you best microphone stands that you can currently find in the market. If you wish to find a versatile microphone stand that will provide you durable tubing, you should consider the Atlas Sound MS-10C best mic stand. It comes with a 10-inch diameter die-cast circular base as well as a wear-proof clutch that will stand the test of time. The clutch comes in three pieces so that you can get excellent locking control that will withstand years of studio and stage handling. The base contains weight distribution features, and you will also get rubber pads that will absorb the immersive amount of shock especially on protect floor surfaces. Tubing is fully adjustable, and the maximum vertical extension can go up to 63-inches. You do not have to worry because tubing comes from rolled steel and it will provide you industry standard that will increase the convenience due to a place where you can put microphone accessories and clamps. Both bottom and top lock nut rings are included for secure and versatile positioning. The first thing that you should remember when it comes to tripod mic stands is that they are one of the most popular solutions on the market. 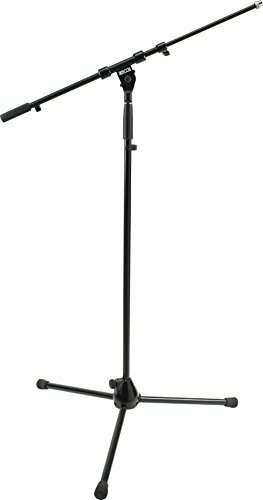 K & M Microphone Stand features telescopic boom arms that are excellent choices for guitarists that have a pedal board in front of themselves during a gig. You can rest assured because telescopic boom will help you change and move microphone wherever you need it without the stand getting in the way of you playing pedals. 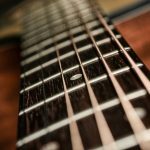 The best thing about it is the affordable price tag that will provide you both a durable and reliable choice for rehearsals and gigging purposes. You will also get a five-year warranty deal. According to most users, it is an excellent solution that you can make on the market due to its sturdy appearance and construction as well as a convenience while moving the microphone. Check this video to see how it looks! If you wish to find a basic tripod microphone stand that features telescopic boom, you should consider DR Pro Tripod Mic Stand. It features 19-inches boom that can extend up to 31-inches. You will be able to enjoy in adjustable height that can go up to 69-inches which means that you can position it based on your needs. The tripod legs are 25-inches on each side, which will give you peace of mind. DR Pro best microphone stand will assure you that you get the perfect combination of value and performance. It comes with a construction that will match industry standards, and it is sturdy, lightweight, and it comes with powder-coated finish paint that will stand the test of time. You will be able to use it for both stage and studio settings due to its versatility and convenience while using it. If you wish to learn how to use this particular microphone stand, you should watch this video for more information! The best thing about Hercules MS533B microphone stand is that you will get a wide array of innovative features so that you can make your performance as straightforward as possible. It comes with instant mic attachment, which means that you have to push the lever up or down based on your preferences and you will be able to mount it in a matter of seconds. You will be able to attach it by using fast setups as well as mic clip for added convenience. The latest 2-in-1 Boom Clamp will provide you the ability to adjust the boom angle and length at the same time. You have to loosen the knob, and you will be able to adjust it based on your desired preferences. You can also detach and attach the boom in a matter of seconds, which makes it a convenient choice when compared with another microphone, stands that you can find on the market. Watch this video to learn more about it! Ultimate Support PRO-T-T microphone stand is the great mic stand that will provide you smooth performance without any additional hassle. It is an excellent choice that you can pair with other PRO-T mic stands so that you can adjust the height and angle based on your requirements. The combination of boom and stand will make sure that you enjoy both studio and stage setup. Similarly, as other PRO series, this particular model is dependable and durable, which is the main reason for its popularity. It comes with unique design as well as patented universal mic attachment where you can place mic accessories and clips alas well. Each stand features thick steel tubing, and due to clutch that can lock with ease, you will get exceptional security during the performance. The tripod bases will provide you strong legs that will ensure its stability. You can also quickly snap it in place so that you can enjoy all the way. If you wish to learn how to use it, we recommend you to check out this video! 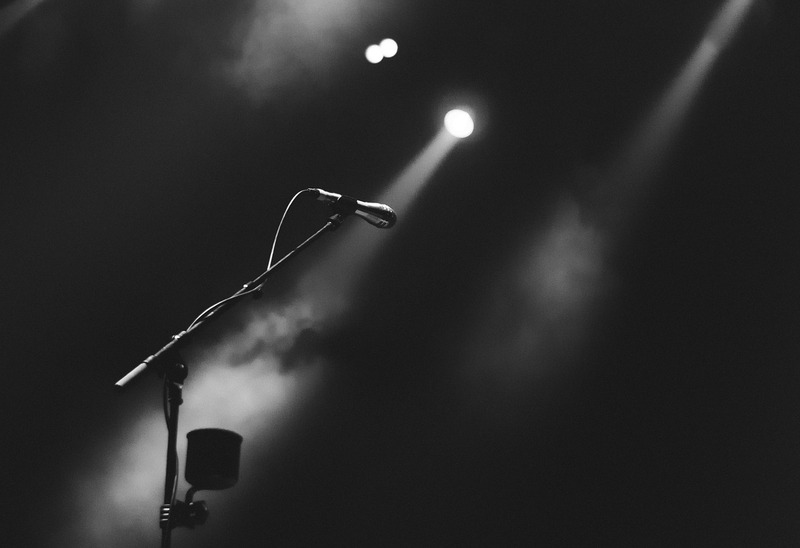 Finally, you are getting the idea of what you should consider when it comes to finding the best microphone stand on the market. The idea is to get a permanent and convenient position that will stay in your studio for years after purchase. Comfort – If you are always using the same mic stand, the main reason should be that you like it. Some of them function differently than others, and the process of adjusting and extending the stand can be different depending on the type and brand you decide to choose. Some of them would allow you to attach a microphone without a clip, while most of them will require a specific clip that you will get with it. 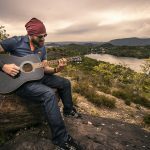 Durability – This is also an important consideration because you do not want to get a mic stand that you should buy every single month due to lousy construction. Therefore, you should find the tough microphone stand that can withstand years of practice and play. They tend to vary in price, but you do not have to spare the entire fortune to get it. However, since every cent counts, you should find the one that you can rely on. Weight – When it comes to weight, you should remember a few things. For instance, round base stands are bulkier than tripod stands, and that is something you should remember. However, round base stands are not the best choices if you wish to move it around and travel with it. Therefore, you should consider based on your goals and what you want to achieve in the future so that you can make up your mind with ease. We have presented you a comprehensive review and buying a guide on the best microphone stand that you can find on the market. As you can see from everything above, you can choose various types based on your preferences and playing requirements. However, it is vital to make a comprehensive analysis because it is useless to buy a new stand every once a while. The high-end position is more expensive than basic ones, but the difference in price is not that significant. High-End Option – Hercules MS533B microphone stand is the best choice that you can make based on your preferences. It comes with innovative adjustment features and exceptional durability, which means that you will be able to use it for years after purchase. Budget Option – K & M Microphone Stand is the most affordable choice that will provide you telescopic boom so that you can enjoy all the way. It comes with a decent price tag but does not worry because the quality is impressive and you will get great locking features as well as other bells and whistles.